If you want to take your guitar on your next big adventure, grab one of the best travel guitars that’ll go wherever you do! While you may be tempted to take your favorite guitar, a compact travel guitar will be easier to pack in your car or stow. Type: We found great options for acoustic travel guitars you can take on your next vacation, or if you want something a little louder, we found some cool electric travel guitars, too! Oh – and some guitars we reviewed can do both! 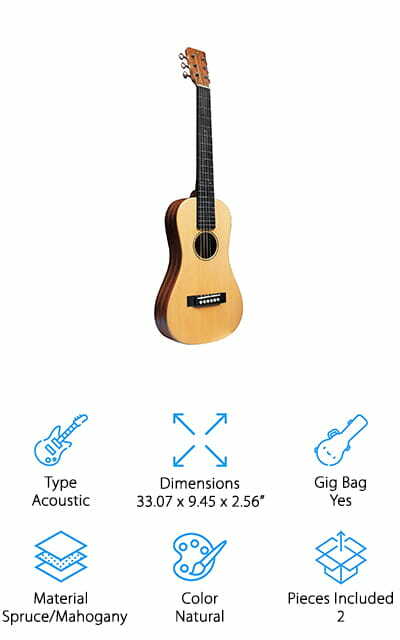 Dimensions: To ensure your guitar fits in your luggage, overhead compartment, or wherever you need it, we’ll let you know the size. If it comes with a case, it’ll be the case size, but if not, it’s just the guitar size. Gig Bag: We will let you know if each travel guitar comes with a gig bag that you can use to store and transport your guitar safely while you travel! It also makes carrying your guitar and extra accessories more convenient, too! Material: You don’t have to sacrifice quality when taking a smaller travel guitar on the road! We found some great options made of high-quality woods like rosewood, mahogany, maple, and more to get a rich sound in a smaller size! Color: In our search for the best travel size guitar, we also didn’t want to sacrifice style, either! We found a variety of beautiful natural wood versions and a few that come in fun colors to blend in or stand out! Pieces Included: Finally, we’ll tell you how many pieces are included in each guitar kit, so you can get exactly what you need for your next travel gig! Some kits are just the guitars, while others have extra picks, strings, and more! Now that you know what to look for, let’s get into the reviews and find the best travel guitar for you! We found 10 amazing travel guitars that are great for taking on the road without taking up extra space. If you want an acoustic, electric, or one that does both – we found plenty of options for everyone! Short on time? No worries! Start with the Top Pick and Budget Pick, and then come back when you have more time! If you’re wondering, “How do I choose the best travel guitar?” you can’t go wrong with this travel acoustic guitar from Fender! This travel-sized guitar has the same body as their full-sized CD-60S, but it has a shortened scale to save space. The mahogany body provides a rich, deep sound you’ll love to play for hours. The rosewood fingerboard has rounded edges, which make this comfortable and easy to play, whether you’re a beginner or professional! We like that this travel guitar doesn’t sacrifice sound quality for size! Oh, and it comes in a right or left-handed model, which is great because left-handed acoustic guitars can sometimes be hard to find! We like the shiny black finish, which looks really cool and doesn’t show wear and tear as much as lighter finishes might – a must for travel! This would make a great guitar for young beginners or adults looking for a great guitar to take on their next camping trip! Our Budget Pick from Hola! Music is a great option for those of you looking to save some money on a travel guitar! This is the best cheap travel guitar to take if you’re concerned that your guitar may get damaged or stolen on your journey. 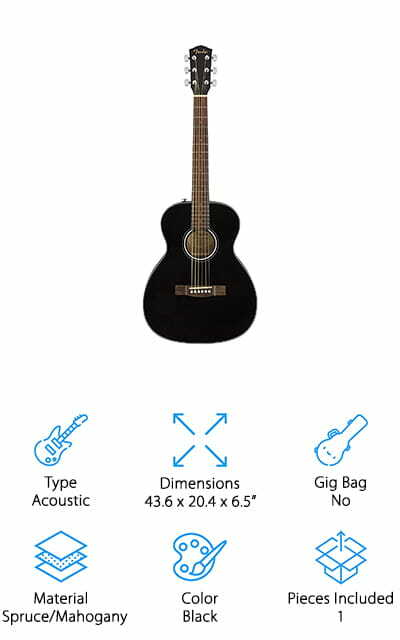 It’s a 3/4-size guitar, which is great for traveling or for youngsters beginning to learn the guitar. The spruce and mahogany body creates a rich sound, while the rosewood neck is easy to play, even for beginners. We also like that you can adjust the distance of the strings to the neck, so you can play however is most comfortable for you! This kit also comes with a gig bag, extra picks, strap, and pickguard to keep you playing without spending a ton on extra equipment. Instead of risking damage or theft to your most prized guitar, grab this inexpensive travel guitar to take your love of music wherever you want to play! If you prefer an electric guitar, we totally understand! We found this great travel-sized electric guitar from Traveler Guitar that has everything you need to rock out – wherever you are! This is the best travel guitar electric guitar fans will enjoy taking on their next road trip or plane ride! The distance from nut to bridge is the same as a full-sized electric guitar, so you don’t have to make adjustments to your playing. The main body is the only part that’s smaller, making it great for taking as a carry on or saving space in your trunk! It comes fully equipped with a built-in tuning system, auxiliary input you can connect to your phone to play along with music, a headphone jack to play without disturbing your neighbors, and 1/4” output to hook up to an amp when you’re ready to show off! It also comes with a gig bag to keep your guitar and accessories organized and protected! Another great option if you’re looking for the best travel guitar case and guitar to take on your next adventure is this mini travel guitar from Cordoba! 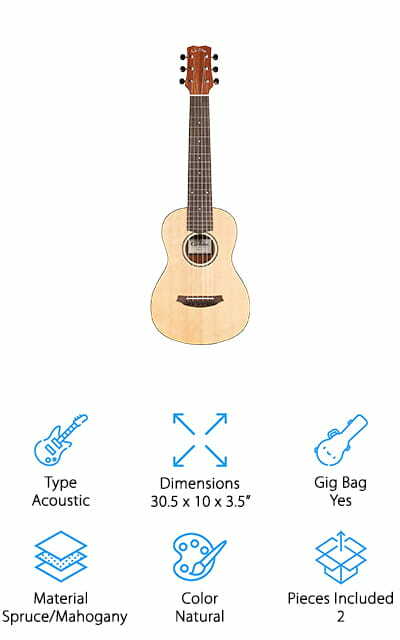 We like this guitar because it plays just like a regular-sized acoustic guitar, with a wide nut which spaces the strings out to what you’re already used to playing. It tunes just like a regular guitar too, so you don’t have to worry about making tuning adjustments because of the smaller size! We also like that this guitar has a crisp, loud sound that you wouldn’t expect from something so small! The spruce and mahogany body is beautiful and will age well as you take this on your adventures. To carry your guitar with you, Cordoba also gives you a custom guitar case that keeps your guitar safe, your accessories organized, and it also fits in most airplane overhead compartments! This is a great guitar to take camping, flying, road tripping, and more! Next up in our hunt for the best travel guitar acoustic players will enjoy is this gorgeous guitar from SX. This guitar isn’t just great for travel – it sounds amazing as well! The mahogany body gives you a deep, rich sound that rivals full-sized acoustic guitars, and the spruce top gives it a light, classic look. The neck is made of mahogany with a rosewood fretboard, which not only looks beautiful, but it plays smoothly too! You can also adjust the neck to however you’re most comfortable – a great thing to have with a travel guitar! It also comes with a padded gig bag that you can use to keep your guitar safe while you travel, and it has extra storage to keep your strap, picks, tuner, and other accessories well organized. We think this would make a great gift for a beginner player, or grab one for a friend who loves playing around the bonfire while camping out! This travel-sized electric guitar from Hofner is great for rocking out or practicing wherever you go. We like this travel electric guitar because you don’t have to worry about adjusting your playing style at all! The neck is the same size as a regular electric guitar, so your spacing is the same and it feels like playing your favorite guitar at home. It also holds a standard tune, so you don’t have to make adjustments to your tuning either! The body is the only part that was shrunk down to make it travel-sized, making it perfect for taking on the road! They come in a variety of bright colors, and Hofner even makes a travel-sized electric bass you can use while you travel as well! 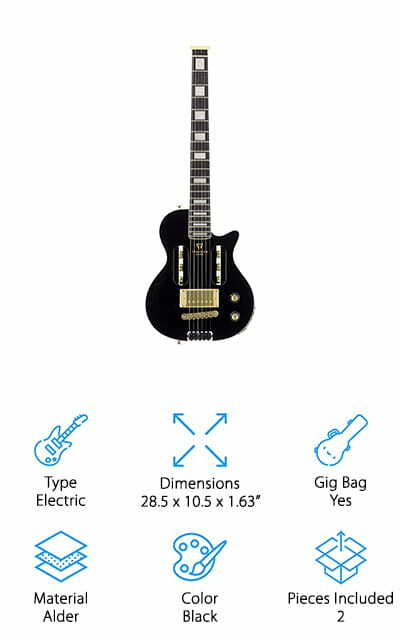 This electric guitar comes with a non-padded carrying case that is lightweight and easy to carry, and it has a small pocket to keep extra picks from getting lost in your luggage or camping gear! 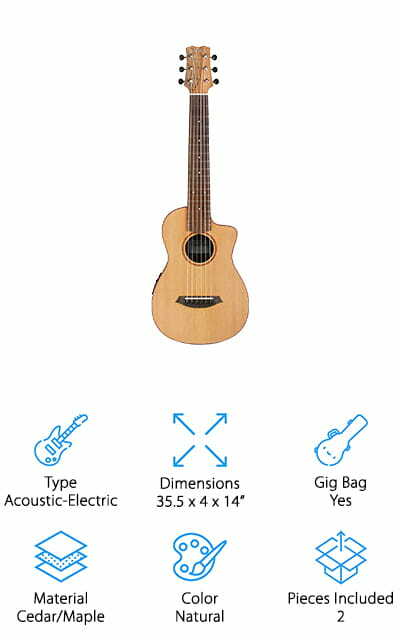 Do you want a travel guitar that can play both acoustic and electric? Grab one of these travel guitars from Traveler Guitar so you have the option to play whatever you want! To play it like an electric guitar, it comes with a built-in tuner and knobs to adjust bass, treble, phase, and volume. There is an auxiliary input you can use with your smartphone to play along to your favorite songs. The headphone jack allows you to play without disturbing neighbors, or you can use the 1/4” output to plug it into an amp and share your love of music with friends! 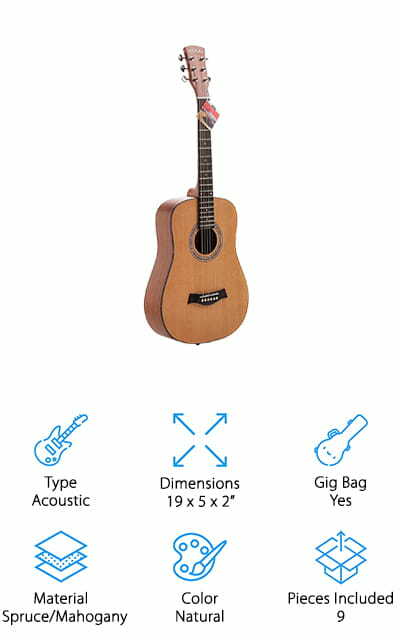 You can also use this guitar to play acoustic music as well, and with a full-sized neck, you won’t have to adjust your playing to fit the smaller size! It also comes with a gig bag that’s lightweight and has pockets for you to carry accessories while you travel, hike, or take a road trip with friends! In addition to travel, a smaller-sized guitar can be great if you have a young child who wants to learn how to play! 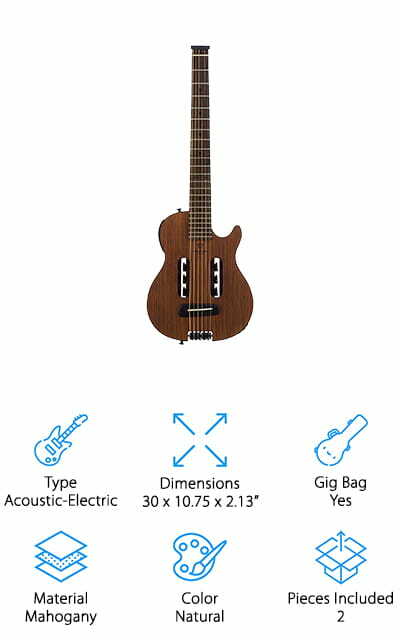 This travel guitar from Vangoa works as both an acoustic and electric guitar, so your child can learn the basics on acoustic, then rock out on electric for fun! We like that this kit has everything you need to get started, including a gig bag, extra set of strings, picks, strap, capo, and an auxiliary cable to hook it up to a speaker. Everything fits neatly in the gig bag, making this a great guitar kit to take while traveling, or take it to your weekly lessons! The guitar has a built-in tuner and all the adjustments you need to use it as an electric guitar. We also like that the string height is adjustable, so you can set it closer to the neck while you’re learning to play, and move them away as you get more comfortable. Another acoustic-electric travel guitar that’s great for taking on the road is this one from Cordoba! 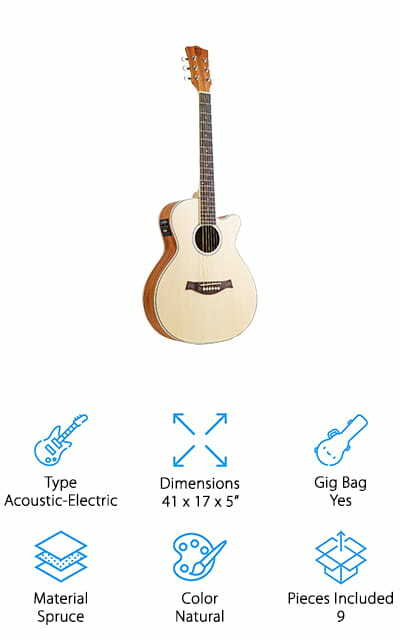 We like this travel-sized guitar because you can use it as a traditional acoustic, or hook it up to a speaker to blast it for your friends, audiences, or for fun! The body of this guitar is mainly maple, giving it a rich sound that’s impressive for something this small. The strings that are included are tuned to A, but you can also buy strings tuned to E if you don’t want to make the adjustment to your playing. We also like that the Mini SM-CE guitar is easy to play, thanks to the string spacing and neck size being similar to a regular size guitar. You won’t have to adjust how you play because it feels just like playing your favorite guitar at home! It comes with a nice gig bag with a pouch in the front for extra picks or sheet music! 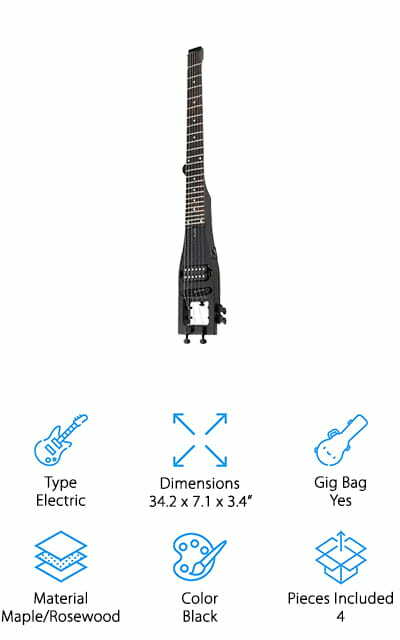 Last up in our hunt for the best small travel guitar is this compact electric guitar from Anygig that can go with you anywhere! We like that this guitar has a standard sized neck with the same spacing as a full-sized electric guitar, but the lack of a body makes it super lightweight and tiny enough to travel with conveniently. To help you adjust your playing without a guitar body, it comes with an adjustable armrest bone that helps you hold your guitar in place. We also like that it comes with an output jack and cord, so you can plug it into a nearby amp and rock out without needing to buy an extra cord! It also comes with a custom carrying bag to keep it protected while you travel! This is a great option for rockers who want to practice or jam while they’re on the road and don’t want to take a heavy, full-sized guitar with them!